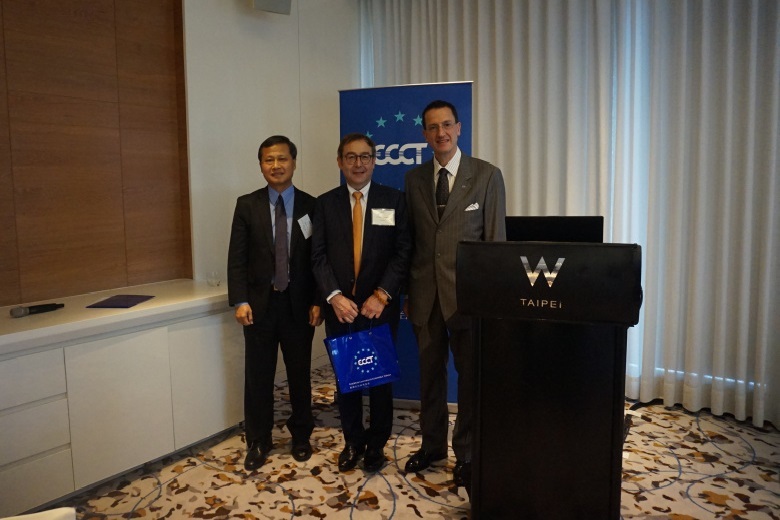 The ECCT hosted a Premium event lunch with guest speaker Klaus Baader, Global Chief Economist of Societe Generale's Corporate & Investment Banking on the global economic outlook for 2019 and 2020. The speaker’s perspective on the current global economic outlook was expressed in the title of his presentation: “Clouds of uncertainty parting”. He explained the theme by saying that while uncertainty and the potential for shocks to the global economy remain, the uncertainties are starting to fade, especially in terms of US-China economic conflict, Brexit, and slowing economic growth. In particular, he believes that a lot of progress has been made in US-China trade talks, thanks to a number of concessions made by the Chinese, which should result in a trade deal in the near future. While the underlying tensions between the US and China will not go away, there is likely to be a lasting truce. On the subject of Brexit, Baader admitted that no one knows how things will eventually turn out and, while one cannot rule out the UK’s exit from the EU without a deal, this is not the most likely outcome. On the subject of economic growth prospects for Europe and China, the speaker said he expected growth in the euro area to strengthen in the coming quarters, and growth in China to stabilise in the second half of this year. However, Societe Generale (SG) is continuing to predict an economic slowdown for 2020, led by the US, where the longest economic expansion in recorded history will eventually come to an end. That said, SG analysts do not foresee anything like the great recession following the global financial crisis, although a US recession will depress growth in practically all other economies, whether directly or indirectly. Potential risks to the base-case economic outlook (SG’s black swan chart) include an escalation of trade war/protectionism (to which SG assigns a risk factor of 15%), a hard landing in China (15% chance), European policy uncertainty shock (15% chance) and a stock market repricing (10% chance). 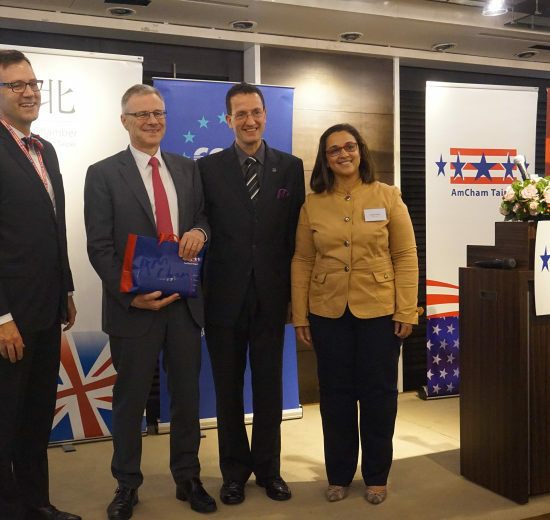 Potential upside surprises could come in the form of a US infrastructure programme (15% chance), upside surprise on fiscal accommodation (10% chance), stronger capex (5% chance) and fast-track reform in Europe (5% chance). According to SG’s forecasts, global GDP growth is set to slow over the coming two years to 3.5% in 2019 (on a purchasing power parity basis) and 3.2% in 2020, after holding steady between 2017 and 2018 at 3.8%. However, the slowdown is expected to be uneven. Based on SG’s analysis of previous business cycles, we are close to the end of the current cycle, which, based on their predictions, will end up being the longest business cycle since 1858. While growth in the EU has been disappointing, economic sentiment suggests that growth should be higher. Growth could be affected by lower oil prices, which have the effect of a tax cut, especially in the EU. Growth in China may be weaker than suggested, especially given sharp falls in exports since the end of last year. However, the rebounding of credit growth (after sharp falls in formal loans and bonds in the past two years), fiscal support and tax cuts in 2019 are likely to spur GDP. SG believes that there is a 70% chance of an extended truce between the US and China, of which there is 50% chance that constructive talks will continue and tariff increases will be delayed further, and a 20% chance that a deal will be reached with conditions on removing current tariffs later. This is based on concessions by China in the form of reducing the trade deficit (buying US agricultural produce), cuts in tariffs, relaxing rules on foreign ownership of operations in China and promises of better protection of intellectual property rights. Baader made the point that while Trump’s threatened increase in tariffs on Chinese imports would hurt China’s economic growth, the impact would be manageable. The problem for the US is that it is increasingly difficult to find sufficient substitutes for Chinese imports. Regardless of the US-China tensions, global trade is already suffering. Manufacturing PMIs have been in negative territory for several months and will take some time to recover. In terms of monetary policy, central banks the world over are in retreat. The US Federal Reserve (Fed) has stopped talking about “normalisation” and is likely to keep rates steady while the ECB is likely to keep its balance sheets larger for longer. If a recession occurs, the US Fed is more likely to cut rates. Baader pointed out that wages are rising but inflation is not, contrary to conventional wisdom that they should follow a similar pattern, although he admitted that the reason is not clear. On the subject of currency exchange rates, Baader said that he believes the euro is undervalued. On the subject of Brexit, Baader said that a no-deal scenario would be devastating for the UK. GDP could fall by between 3% and 8%, initially. The impact on the EU would also be severe (between a fifth and a quarter of the impact on the UK), although the impact would be more strongly felt in countries like Ireland. In the UK, inflation would rise, driven by the likely fall in the value of the pound, while the impact on the UK’s property market could be dire (up to a 50% drop in the value of commercial real estate).